Quiet Voice Audio (QVA) recently performed a major upgrade to the sound system at Calvary Chapel South Bay (CCSB), installing QSC WL3082 WideLine 8 Series Line Arrays with GP 188 and GP 218 Series Subwoofers, and dedicated PLD Series Processing Amplifiers. 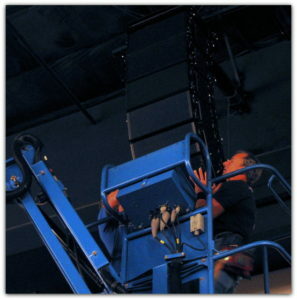 The line array loudspeaker system, installed in a left, center, right configuration, is designed to support the church’s three Sunday services, featuring a dynamic, contemporary Christian music program, and replace a 20-year-old system. Jon Bart, QVA’s Owner and Senior Design Engineer, reports that the company has enjoyed a nearly decade-long relationship with Senior Pastor Jeff Gill at CCSB. “Our first few meetings with Pastor Jeff and Worship Leader Kevin Click gave us insight into the scope of the music department’s role in services and also the complexity of the coverage of the 1,700-seat venue,” he says. “Due to the demands on the speaker system to provide concert level sound we decided the best route to take was the QSC WL3082 passive WideLine 8 arrays with matching 18-inch passive subs and dedicated amplification,” says Bart. A total of 18 WideLine 8 modules were used, configured as left, center and right arrays. Two GP118-sw single-18-inch and two GP218-sw double-18-inch subwoofers were installed below the 50-ft. by 30-ft. stage. “A common problem with sound systems is the underpowered sound of amplifiers being taxed at higher SPLs,” comments Bart. “We believe in an airplane hangar’s worth of headroom when it comes to amplification, to the point that no amplifier channel is being taxed at maximum dynamic range. The intelligent choice was the QSC PLD4.5 amplifier with DSP.” A total of six of these four-channel amplifiers were used to fully power the new speaker system.